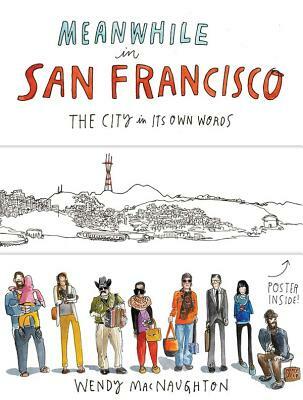 Take a stroll through the City by the Bay with renowned artist Wendy MacNaughton in this collection of illustrated documentaries. With her beloved city as a backdrop, a sketchbook in hand, and a natural sense of curiosity, MacNaughton spent months getting to know people in their own neighborhoods, drawing them and recording their words. Her street-smart graphic journalism is as diverse and beautiful as San Francisco itself, ranging from the vendors at the farmers' market to people combing the shelves at the public library, from MUNI drivers to the bison of Golden Gate Park, and much more. Meanwhile in San Francisco offers both lifelong residents and those just blowing through with the fog an opportunity to see the city with new eyes. Wendy MacNaughton is a New York Times best-selling illustrator and graphic journalist based in San Francisco. Her previous books include Lost Cat: A True Story of Love, Desperation and GPS Technology and The Essential Scratch & Sniff Guide to Becoming A Wine Expert. Her clients include the New York Times, The Wall Street Journal, and PRINT magazine. She is a contributor to Pop-Up Magazine and a collaborator at Brain Pickings. She lives in San Francisco, California.